Sarwat Chadda's Blog: Summer Scream! What are you doing on Saturday 19th June? Are you in Northern Europe? Whatever it is, cancel it (they'll forgive you) and come to this instead! 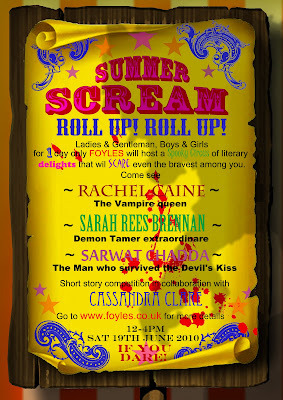 Foyles Bookshop (yes, THE Foyles bookshop) are organizing a gothic horror treat of fantasmagorical proportions. Taking the theme of horror circus you'll be able to meet Rachel Caine, Sarah Rees Brennan and me and discuss all things supernatural, paranormal and BEYOND! 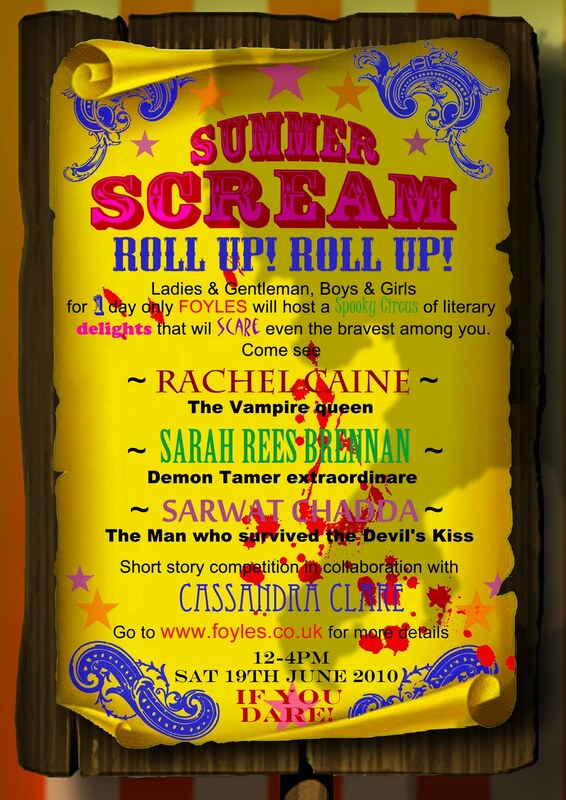 Rachel's the bestselling author of the Morganville Vampire series to give all you fang-fiends something tasty to chew on and this is one of her rare visits from the sunny US of A. Sarah's great debut, The Demon's Lexicon, is a YA urban supernatural series set in the not-so-sunny UK and centres around a pair of demon hunting brothers. The sequel, The Demon's Covenant, would have just come out. As well as signings and Q&A session there'll be competitions (I've seen some of the prizes and all I can say is 'juicy'), including a short story competition kicked off by Cassandra Clare. So, if you've ever wondered about getting into the spooky story business, this is your chance! My own small contribution to this will be the early release of Dark Goddess. So, rather than wait with every one else you'll be able to get your hands on it two weeks early, and signed (assuming I remember my pen). You will be instantly adored by friends and family! I guarantee it! Honestly, I feel light-headed even thinking about it. I'ts really awful to have this going down right across the water and still not being able to attend. I would love to go, but there's no way I could make it. Anyway, people who do go, have fun! It's all gathering apace so should be great fun. Maybe drinks after?